I thought that I would introduce myself. 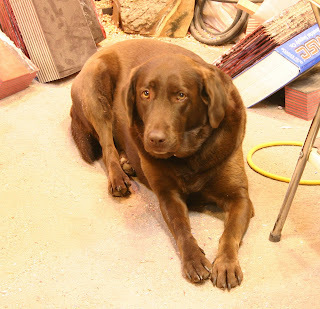 My name is Hershey B. Dailey and dad calls me the shop foreman here at Dailey Woodworking. I actually like to call myself shop dog extraordinaire. I have Dad busy at the lathe working on orders so I decided to write this post. I don’t want to brag or anything but things just wouldn’t run smoothly without me. I like to greet people and whenever dad stops I am immediately up to find out why. He thinks that I want to be petted but I am actually trying to make sure that he doesn’t take a very long break. We’ve got a couple of cats here as well, Twix and Snickers. They seem to be useless though. All they do is eat, sleep and well you can guess the rest. Oh, I’ve got to go he looks like he’s trying to take a break and I’ve got to keep him working. We’ve got a lot of orders to fill.